You have added When In Rome White and Gold Embellished Maxi Dress into shopping cart. This gorgeous white and gold embellished maxi dress has an angelic look to it! The When In Rome White and Gold Embellished Maxi Dress is fully lined to the mid-thigh. It has a sweetheart neckline, lightly padded bust, an empire waist, and a full length maxi cut. Adjustable and removable spaghetti straps are included with this dress so you can decide if you want to wear it strapless or not. Ivory pearl and gold bead embellishments decorate the neckline and below the bust. Ruched fabric at the back of this dress expands to fit your shape. 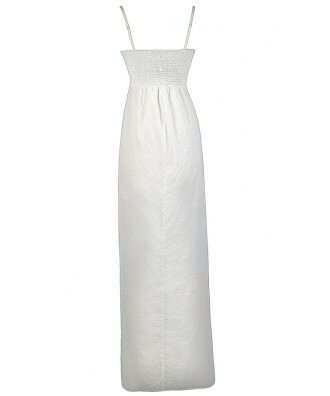 The When In Rome White and Gold Embellished Maxi Dress would look perfect paired with beige or gold heels or wedges. You could also dress it down with beaded flats and a gold headband for a boho look. Details: Lined to mid-thigh. Lightly padded bust. Adjustable and removable spaghetti straps included. 100% polyester. Dry clean only. Small measurements: Length from top of bust to hemline: 56". Bust: 34". You have added When In Rome White and Gold Embellished Maxi Dress into Wishlist. You have added When In Rome White and Gold Embellished Maxi Dress for Stock Notification. 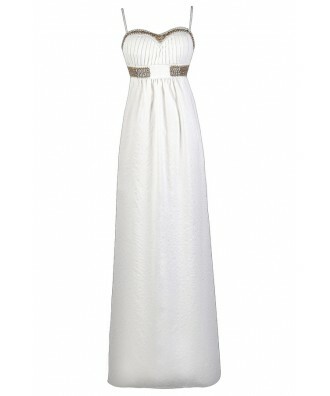 You have set When In Rome White and Gold Embellished Maxi Dress as a loved product. You have removed When In Rome White and Gold Embellished Maxi Dress as a loved product.